An Ocean Wise recipe from chef Ned Bell. Rainy autumn on the west coast of Canada can be very gloomy and grey. Warm, nutritious, simple and exceptionally seasonal, this wild salmon with warm chickpea salad and cranberry pickle recipe is perfect for gatherings of friends and family. This is sure to be a dish that you return to more than once and even adapt to incorporate different ingredients as the seasons serve them up. 1. Pan sear, BBQ or grill the fish for about 2-3 minutes per side, season with Vancouver Island sea salt and cracked black pepper. 2. Make the salad: in a saute pan, sweat the shallots with the olive oil, add the sea salt, the lentils and the chickpeas, add the hazelnuts last. 3. Cook everything together in a small pot for 15 minutes, cool before serving. This cranberry and honey “pickle” is also great on grilled fish, Ocean Wise seafood or grilled veggies. Also great on cheese plates or over vanilla ice cream. 4. 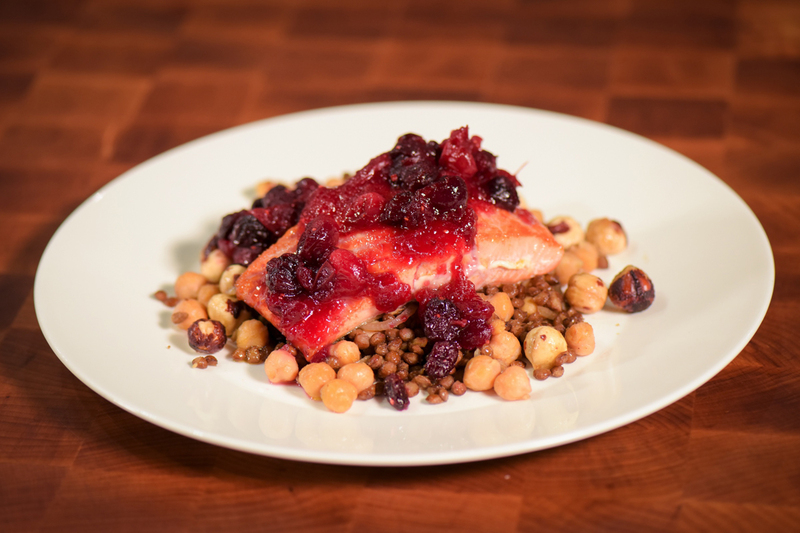 Build your plate with the warm salad, place the salmon on top, add the cranberry pickle and enjoy.